Transplanted Thoughts | Life is still funny. I should have said no. When they called. “The” call. I should have said no. I thought about it, I mentioned it to the nurse. What happens if I say no? Can I think about it for a few minutes? My gut said no. My heart said yes. Because this was the best option for him to have a normal life. To be like other kids, to be like his brothers. Okay, maybe not all of August. I hate August 19th. The day I should have said no. It was meant to be a second chance. That’s what they say. Transplants are a second chance at life. But it wasn’t. It was the beginning of the end. The beginning of 5 grueling months of pain and heartbreak leading up to the absolute end. Time softens the raw emotion of death. That primal ache becomes a soft buzz in the back of your mind. It takes up residence and becomes a part of your day to day existence. It’s not his death that haunts me. It’s the fact I should have said no. The fact I could have done something different. That’s what haunts me. The possibility that things could have turned out differently. August is a sucker-punch to the gut. Nathaniel’s five short days of life grace the end of August. 16 years of grieving a babe that I never even heard cry. David and Nathaniel are intertwined in this month of should-haves and what-ifs. The doctor knew. He knew I would spend the rest of my life berating myself for that decision. He stood in front of me, tears running down my face, my arms heavy with emptiness. He looked me in the eyes, gripped my shoulders and said: You did the right thing. I nodded. You did the right thing. We always talk about how fast or slow time goes by and four years certainly feels like both forever and just yesterday. The good – forever ago and the bad – just yesterday. I wrote this letter the day of your funeral – I still cry when I read it. My heart will always be broken, there’s just no way to heal the empty crevice you left. But that’s okay, I wouldn’t want to. Your physical presence in my life was a gift, no matter how temporary. Your sweet soul fills that deep crevice and holds the pieces of my heart together. Rest easy, Capt Snuggles – you are loved beyond measure and will never be forgotten. David Henry, this is a hard letter to write. I wish that it was a rambling account of how things are this year, historical facts to remember, events to recount for when you grow old. But therein lies the problem. I write this letter because I know in my heart of hearts – you will never grow old. Those words rip out my heart and make me weep. I am at a loss on how to say goodbye. Can I be honest with you? I was devastated when I learned I was pregnant again. I struggled with the prospect of motherhood overloaded. But I want you to understand, no matter how I felt before you were born – I loved you completely when you arrived. I really can’t believe it – but here it is – I am a published author! Sunshine After the Storm: A survival Guide for the Grieving Mother is a compilation of stories from fellow babyloss mama’s. I am honored that I was asked to contribute and I hope it helps mother’s that are struggling with loss. My story is the second chapter and in it I talk about the differences between losing Nathaniel and David and how social media was instrumental in allowing me to grieve them both. A compelling read from start to finish, this supportive guide to navigating pregnancy and infant loss will arm you with life-changing tools that will help you feel part of a dynamic community. The complexities of pregnancy and infant loss are explored by survivors themselves rendering this must-read book a first hand personal narrative that invites people to feel less alone in the aftermath of such devastating experiences. Grief knows no timeline and this thoughtful book does an exceptional job of explicating ways that society could more sensitively embody this concept by normalizing the spectrum of mourning. Profound losses create seismic changes in self-image, relationships, and overall identity. Many women blame themselves for their reproductive hardships and harbor monumental shame as a result. Contributors delve into crevices of their minds and hearts and courageously express the complexities of their processes- journeys that should be shared and not silenced, providing enlivening inspiration and raw accounts of how life perspectives are invariably altered in the wake of loss. This accessible guide provides valuable tips and resources for grieving families which serve as a grounding way to acknowledge the pain, ease the grief, and explore pockets of hope.A vital resource for anyone who has experienced these kinds of losses and those who love them. The best part is that from now until 10/17/13, it’s free to download for Kindle. Follow the link above to download your very own copy. Visit Kat Biggie for a chance to win a copy! Physical copies are also be available for purchase here. You can like us on Facebook, too! We were originally going to go camping this weekend. Then a cub scout camp out at the end of the month had me thinking I would reschedule the zoo trip to this weekend. Then I found out there was going to be a Discover the Dinosaurs event this weekend. But that little excursion was $100, just to get in the door. 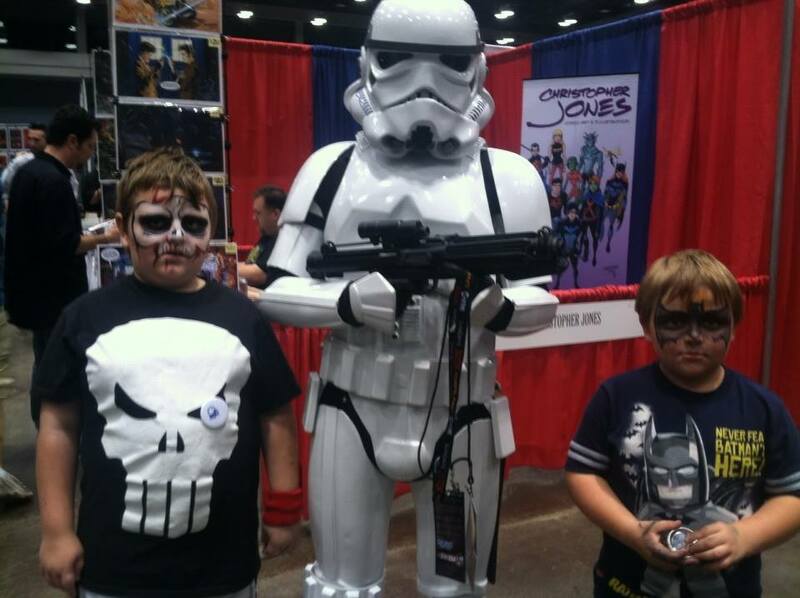 Then I found the Cincinnati Comic Expo. $20 bucks and kids under 12 got in free. We spent 5 hours walking around the Duke Energy Convention Center in Cincinnati. 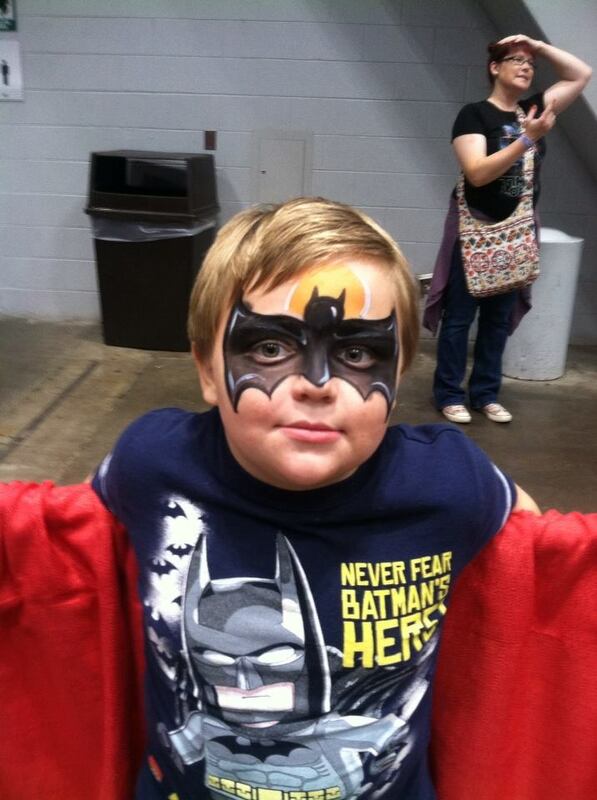 First there was a little face painting. 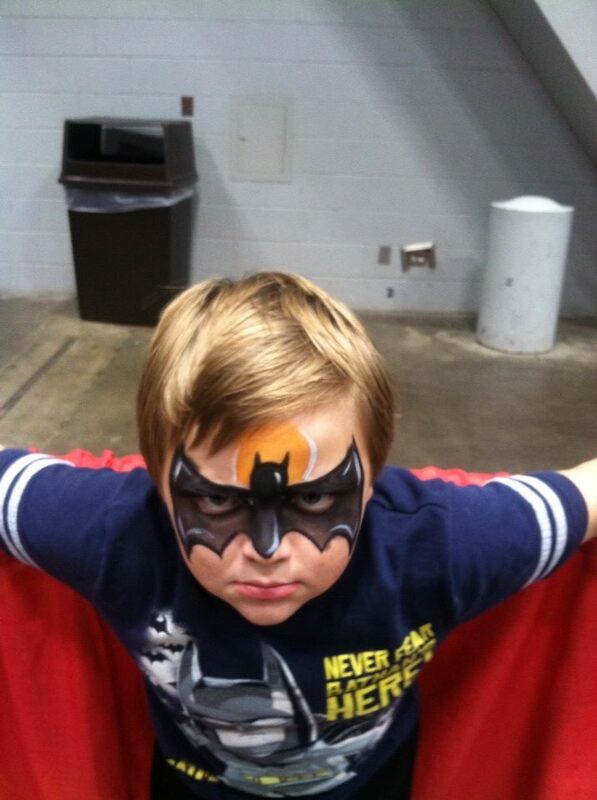 Bruce Wayne is for me – that’s what he said after he got his face painted! 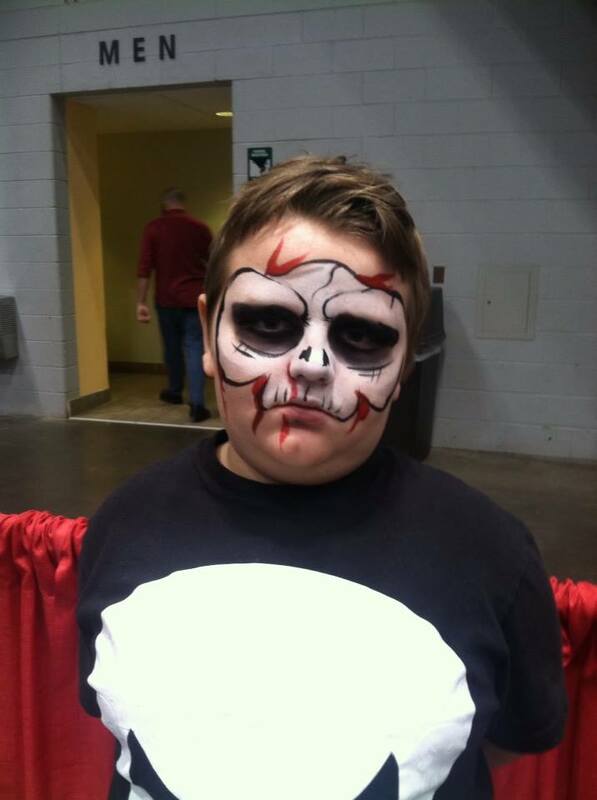 The Punisher doesn’t look happy – but he declared today the most fun he’d ever had! Then there was some Star Wars love. They gave us special badges with R2-D2 and C3P0 on them. If a Storm Trooper found you wearing the badge, you got a raffle ticket. We didn’t win anything in the raffle, but it was fun hunting the Storm Trooper! This? Totally made out of Lego’s. 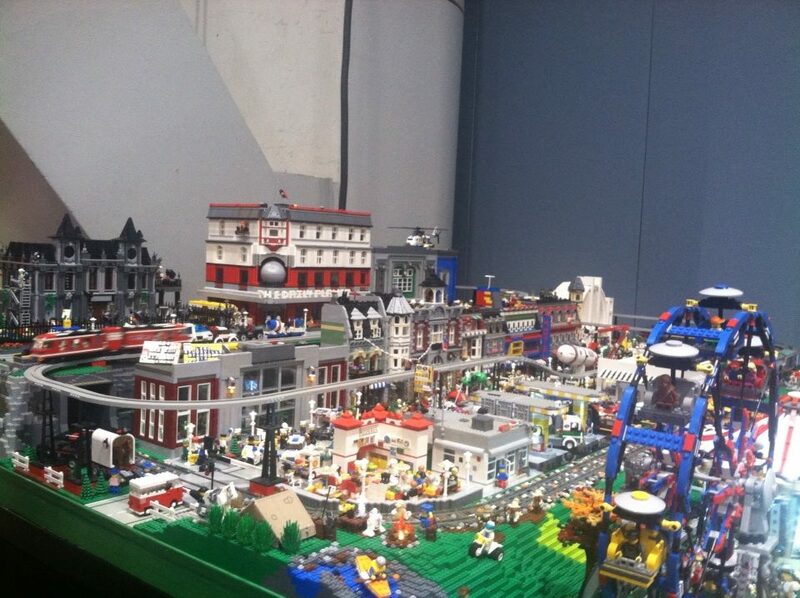 There was a scavenger hunt where you had to find 10 villains and 10 good guys hidden in the lego buildings. It took us several go a round’s to find them all, but we did it! Zachary might have a wee obsession with My Little Pony. 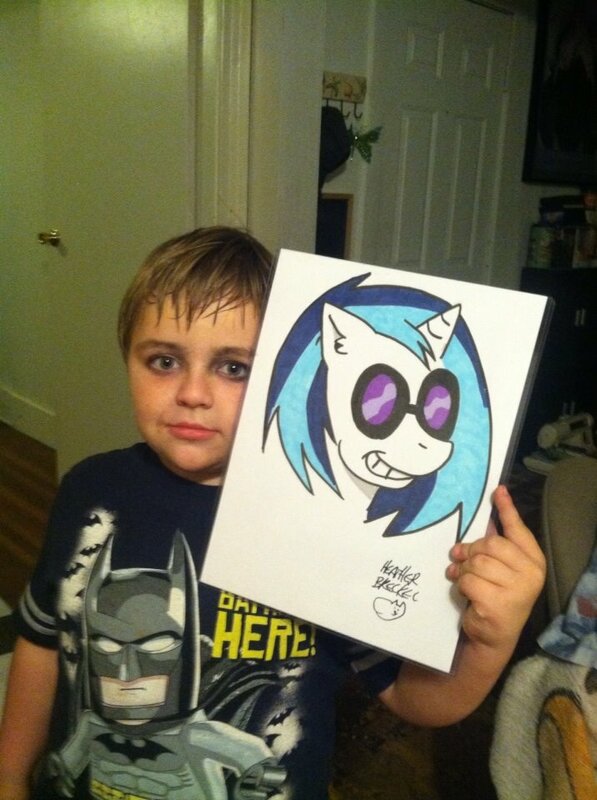 Zachary got to meet one of the pony artists and have a custom pony drawn just for him. This is Dj Pon-3 as drawn by Heather Breckel. He stood and watched her draw this for twenty minutes. Needless to say, he was in 7th heaven! Jonathan asked if we could go next year. The only thing we really missed is dressing up. There were lots and lots of folks walking around in costume. Since I only found out about it the day before, we didn’t have time to make costumes – but next year, watch out! They need to make a Batman vs. My Little Pony game and he’d be over the moon! Did I mention that my marriage collapsed? There’s no denying it was limping along before David was born. But after he passed away? It pretty well died right alongside him. It took almost two years to shake off the funk long enough to acknowledge it’s demise. So now I have my own house, a job and 3 very handsome young men fighting me for the only toilet in said house. I do like my job though…..
And speaking of young men, the boys are now all in elementary school. Zachary is in Kindergarten, Jonathan is in third grade and Jacob is in fifth. And for this year only – they are all in the same building! This year is particularly bittersweet though, because if David were here, he would have started preschool – in the same building! So it was with great trepidation and angst that I watched all 3 board the bus that first day of school. I know that I was struggling with my writing because grief and depression peppered everything I wrote. And for me to continue writing like that, it wasn’t helping me to resolve anything. It just kept feeding me more grief and deeper depression. And really, it wasn’t just my writing that was suffering – it was my very being. So here I am. My head is a tad clearer. I recognize that there will always be events that trigger episodes of emotional turmoil, it’s all a part of this thing called life. But I have found ways to work through them. And if ordering take-out and watching Netflix for 12 hours straight is not a medically approved coping strategy – it should be. The wait is over…..Life goes on….David’s Story.